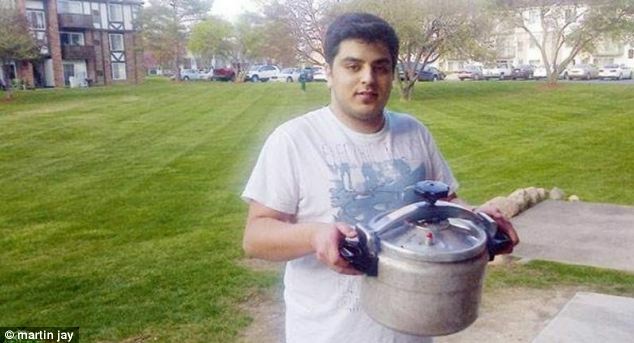 A Saudi student living in Michigan was questioned in his home by FBI agents after neighbours saw him carrying a pressure cooker and called the police. Talal al Rouki had been cooking a traditional Saudi Arabian rice dish called kabsah and was carrying it to a friend’s house. According to reports in a Saudi newspaper on Friday, the FBI are increasingly vigilant about ‘pressure cooker’ home-made bombs after the Boston bombers used one to make an explosive. The Saudi journal, Oukaz reported on the story of the Saudi student who had FBI agents come to his home, following a tip-off from neighbours that he was seen moving about with a pressure cooker bomb. While armed agents surrounded his apartment block, other agents, asked a ‘nervous’ Mr al Rouki if they could come in to question him. ‘They asked me about my major, when I arrived in the US and what I do in my spare time’ he told the Saudi newspaper. Officers said that two days earlier that a woman had seen him walking out of his apartment carrying the pressure cooker pot, which was described as ‘bullet coloured’. The young student showed them his pressure cooker and explained to them he used to make a rice dish.